BALTIMORE (CNS) — U.S. bishops admitted during a wide-ranging discussion during their fall general assembly that parishioners are angry and continually ask how a charismatic clergyman was able to rise through church ranks despite widespread knowledge of allegations that he sexually abused seminarians and boys. 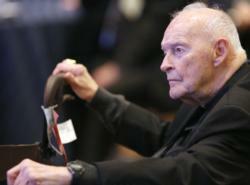 The predicament in which the church finds itself stemming from the fallout surrounding Archbishop Theodore E. McCarrick has left the bishops with few satisfactory answers for parishioners. The bishops also are faced with having to reflect on how they can become better shepherds in a time of widespread doubt and distrust within the church, several bishops said during a 65-minute session Nov. 13 at the assembly in Baltimore. Bishops said they have heard in writing and in listening sessions from upset parishioners about the renewed scandal surrounding months of reports of clergy sexual abuse and the failure to adequately respond to problem clergy. Words such as “outrage,” “anger” and “abuse of power” permeated their comments. Pope Francis accepted Archbishop McCarrick’s resignation from the College of Cardinals in July following reports of sexual abuse allegations involving minors decades ago and seminarians more recently. He has denied the allegations. Bishop Barron added that he hopes the investigation sought by Cardinal Daniel N. DiNardo of Galveston-Houston, president of the U.S. Conference of Catholic Bishops, moves forward both in the United States and at the Vatican. Cardinal Joseph W. Tobin of Newark, New Jersey, responded to several bishops who wondered about the status of the investigations. He said the Vatican’s inquiry is underway and that officials in each of the dioceses and archdioceses where the former cardinal served — New York; Newark and Metuchen, New Jersey; and Washington — are slowly moving forward, but that they are being complicated by factors outside of the church. The New Jersey attorney general is investigating the church’s handling of abuse claims and is limiting how quickly church officials in Newark and Metuchen can access its files, Cardinal Tobin said. “We are ready to go, but need the attorney general’s go ahead,” he said. As the conversation opened, Cardinal DiNardo said that a task force of three former USCCB presidents has been formed and they will provide regular communication with bishops and the wider church about responses to the abuse crisis. The announcement met with wide approval from the assembly. Task force members are New York Cardinal Timothy M. Dolan, Atlanta Archbishop Wilton D. Gregory and Archbishop Joseph E. Kurtz of Louisville, Kentucky. Cardinal DiNardo said he will chair the group. The conversation also surfaced some willingness among bishops to pass some sort of resolution to act despite a Vatican letter asking that no action be taken on proposals that include establishing standards of episcopal accountability and forming a commission that would handle complaints when the standards are violated. Bishop Thomas J. Paprocki of Springfield, Illinois, offered that a nonbinding vote be taken to convey a sense of the bishops’ intentions to tackle the abuse crisis and send a message to parishioners. Other comments offered suggestions for the need to recommit to transparency and accountability in ministry and the need to restore the trust of the laity across the church. He also called on the USCCB leadership to appeal to Pope Francis for help in seeking to restore trust and accountability. At various points during the conversation, bishops reflected on the spiritual side of their lives, with some suggesting that the way to restore trust and develop a better understanding of what it means to be a prelate involves a deeper relationship with Jesus. Cardinal Roger W. Mahony, retired archbishop of Los Angeles, recalled the life of St. Charles Borromeo, who faced a church in crisis in the 16th century, who invited priests and bishops to be more collegial and to do so through prayer. “It would seem to me that we as bishops need to form more and more prayerful relationships among ourselves … and ongoing opportunities for our own relationship based totally on Jesus Christ,” he said. Archbishop Alexander K. Sample of Portland, Oregon, said he has taken a “hard look” at his life and how he carries out his ministry since the scandal arose in June. Jesus offers each person facing troubled times. He said he has found comfort in the “saving power” of Jesus. Being grounded in the mission of Jesus that calls for serving the faithful as shepherds is vital in restoring trust, explained Archbishop Thomas G. Wenski of Miami. Laypeople, he added, are willing to partner with the bishops to guide the church out of the crisis it faces. I agree with Nicholas. We have to not give them money. My husband and I have not donated since August after the Pennsylvania grand jury report. Until the criminals in the church go to jail for their crimes, the church cannot be healed.The laity has to speak up, take action. The other story concerning the overwhelming passage of the stand against racism is an example of the proverbial candy bar that everybody can like. Of course we all stand-or at least should- as Christians against all forms of oppression. It took no courage for the bishops to jump on that bandwagon. But what about the courage to stand up – possibly against the Pope- when it comes to dealing with this sad issue that is tearing our Church part? I can certainly understand the reluctance to bash the boss but sometimes a stand requires a sacrifice. In light of the just passed Veterans Day, it’s time the royalty in our Church stands up and maybe takes the hit but go down as heroes. Is it time to hold the Sunday collection hostage and place it in escrow until the Chiefs of Clergy make up their minds??? Every parish in USA has to give a certain % of the Weekend take to their Archdiocese. Originally from Philly, in our parish in Chicago 14 % of the weekend take gets sent to the Archdiocese. in light of what Cardinal Cupich has done through this week, I hope my friends give only this way: earmark your check to the building fund, the school, the priest of (parish name) the sidewalk reconstruction, the basketballs used for the school, as opposed to saint (parish name) under the c305 nontaxible donation. It goes to the check which has the name on it and cannot be split. They’ll loose their non-tax status. The bishops are not serious. They sat and listened as Mahony, one of the bishops who protected predators and sacrificed young people babbled about spirituality? It’s a wonder God doesn’t strike them all down. The laity need to act. Embargo. No money in the collection plate for the rest of the year. They don’t fear God, but they’ll fear the loss of income. Thanks for speaking up. Seems catholics have been taught, from young age, to not question authority & not have independent opinions. This is the result of that early Catholic teaching & it is really upsetting to many.